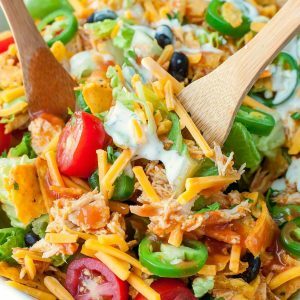 This tasty buffalo chicken taco salad is a fun twist on the classic! I topped mine with an all-natural ranch dressing and an extra drizzle of hot sauce. Feel free to follow suit! You can also try it with blue cheese dressing or snag your favorite salsa/guacamole to use as a fiesta-worthy salad dressing! Yum! Prep your chicken (see notes below) and chop your veggies for the salad. Melt butter and combine with hot sauce, whisking to mix. Pour sauce over chicken and serve over lettuce with all your favorite toppings from the list above! Drizzle with dressing of choice (I opted for ranch and a hearty drizzle of hot sauce) and dig in. This chicken is a fabulous use for leftover or rotisserie chicken! You can also cook it up fresh via your favorite cooking method. Grilled, poached, pressure cooked, slow cooked, baked... anything goes! Making this salad for a crowd? It's easily doubled, tripled or quadrupled to feed your hungry family and friends! The general rule of thumb is that a serving of chicken is 4 oz, which equates to a 1/2 cup of shredded/chopped chicken. Multiply the chicken and sauce ingredients as needed and then just wing the lettuce and topping measurements, since those are totally customizable and a breeze to toss together. Hope y'all love it as much as we do!